With New York Fashion Week 2017 in the books, we have had some time to reflect on the highly anticipated Yeezy Season 5 clothing line. 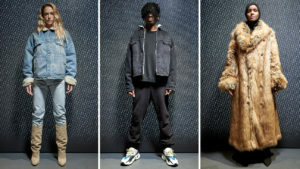 When Yeezy Season 5 hit early obstacles with Kanye scheduling his show in conflict with other important fashion week shows, and without confirmation from the powerful New York Fashion Week executives, it was indicative of the failures of Season 4. Much to everyone’s surprise, the Yeezy line rose from the dead. To start, Kanye’s show only began thirty minutes later than the set time, which is well within the fashionably late norm that the fashion world operates. Kanye massively improved on the venue and debuted Yeezy Season 5 at Pier 59. The invites, like his previous ones, wore olive long sleeve shirts, embroidered with Lost Hills, a location in Calabasas. The venue was a small room with chairs surrounding a large black box in the middle. The show began with the models being projected on each of the sides of the centered box. Kanye, surprisingly, used The-Dream’s cover of J-Holiday’s “Bed,” an R&B track from 2007, an amazing throwback, although disappointing because it crushed hopes that he would be dropping a new album like Yeezy Season 3 which came with The Life of Pablo. The models that were projected came in the form of videos with them standing still, sporting the new line, and turning slowly on a turntable.The box also turned. Finally, the models were revealed, walking around the box, offering an amazing, intimate view of the clothing for the attendees. The clothing had the same industrial look but also drew from the mainstream culture. He combined his style with flannels, camouflage, denim, and athletic leisure. The “Calabasas” style also finally made its appearance after the months of teasing from the Kardashian-Jenner-West family. Kanye also kept his muted tone color scheme but also included a deep forest green and burgundy which was refreshing. The best part of the show was Kanye’s inclusion of a hijabi Somali-American model, 19 year-old Halima Aden, who killed it on the runway. This line seemed far more accessible to those of us strutting around college campuses; hopefully Kanye will keep on his promise of making his clothes more affordable. If you’re itching to see the show, there are plenty of photos and videos one Google search away, and it’s totally worth it. Junior Jesika Islam is the Assistant Arts & Leisure Editor. Her email is jislam@fandm.edu.